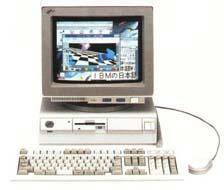 5510 series were introduced to the consumer market to spread out IBM Japan's DOS/V technology. PS/55s ( with 386DX processor and Japanese Display Adapter ) were mainly targeted to the business market and they were very expensive. Especially PS/55 Japanese display adapters designed for high resolution graphic environment were very expensive and pushed up prices of PS/55s. In order to confront NEC PC 9801, and to extend the superiority of DOS/V architecture against Japanese specific "closed" architecture relating handling of Japanese characters. 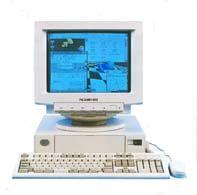 DOS/V architecture enabled any IBM PC/AT and PS/2 based computers to handle Japanese characters just with VGA video sub-system, 80286 and upper CPUs and with 2MB of system memory. IBM needed cheap and competitive priced PC for their new DOS. Thus PS/55Z 5510 series were put on the market shortly after IBM DOS J4.0/V had been announced. DOS J4.0/V was based on POC DOS 4.0 and some programs for handling of Japanese characters were added such as $FONT.SYSm, $DISP.SYS, $IAS.SYS and Japanese Font Files. If these drivers are not loaded, DOS 4.0/V acted just like as pure PC DOS 4.0 and compatible with any of software written in English but once those drivers are loaded it provides Japanese environment. CHEV command allows changing of Japanese and English environment ( basically within Japanese environment ) while SWITCH command rebooting a system with real English ( PC DOS ) environment without DOS/V related drivers. Following version, DOS J5.0 included PS/55 high resolution mode for existing PS/55 Display adapters and softwares written for IBM DOS J4.0 along with DOS/V drivers. DOS J5.02 was the last release which supports PS/55 High-Resolution together with DOS/V VGA resolution. There are two versions of J5.0 and J5.02 with " /V " extension which does not contain PS/55 High Resolution mode. PC DOS 6.1/6.3/7.0 and 2000 are all based on DOS/V only and do not support PS/55 High-Resolution. defined as " Entry model". As you can see, front face of 10-Z looks like PS/2 model 8576. HD; IDE 40MB for Z04 and ZJ4. 5510-S was not an MCA system. It was based on AT architecture. and softwares for DOS/V specification. Capable for 800 x 600 SVGA mode. HD; IDE 40MB for SV4 and SW4. 5510-T First model was released in May 1991. 5510-T was not so cheap as PS/55Z but cheaper than MCA models with Japanese Display adapter. This model was equipped with a 386DX CPU though it was classified under PS/55Z. I do not know difference between this model and 5540-T aside from the fact that 40-T can't take XGA while 10-T can ). 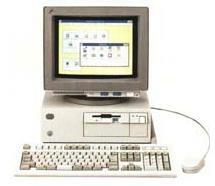 Later model was sold along a 1MB XGA /A.